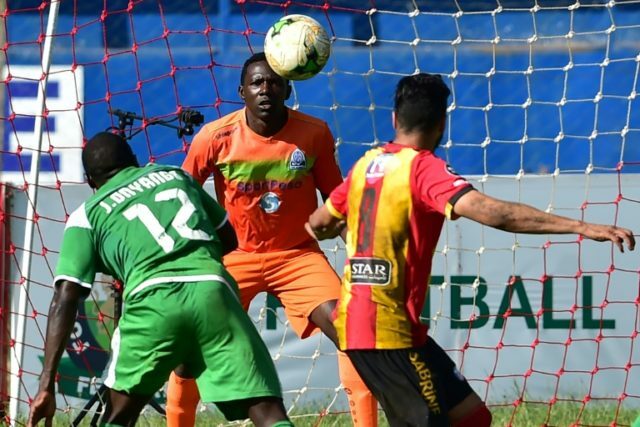 Johannesburg (AFP) – Gor Mahia of Kenya survived an onslaught from New Star of Cameroon to draw 0-0 in Limbe Sunday and reach the CAF Confederation Cup group phase for the second successive season. The Nairobi outfit won the play-off 2-1 on aggregate having created a narrow first-leg advantage in east Africa last weekend. It was the first time in 15 CAF away matches spanning seven seasons that the Kenyan club kept a clean sheet. New Star, whose line-up included star striker Junior Ngongang, applied constant pressure throughout only to be denied by the visitors. Goalkeeper Boniface Oluoch was constantly in action for Gor, who survived despite lacking suspended defenders Joash Onyango and Haron Shakava. The Kenyans will discover Monday which three clubs they will face in the group stage when the draw is made at CAF headquarters in Cairo. Among the sides they could face are trophy-holders Raja Casablanca of Morocco, who are likely to be among the top seeds. Raja made hard work of eliminating minnows African Stars of Namibia, winning only 1-0 in Marrakech after the first leg had been drawn 1-1 last weekend. The six-time CAF title winners had to wait 57 minutes for the breakthrough with captain and centre-back Badr Badoun nodding in an Abderrahim Achchakir free-kick. Badoun was unlucky not to score again when he connected with a Zakaria Hadraf corner only to be denied by an outstretched Namibian leg. An eventful second half for the Raja captain continued nine minutes from time when he was yellow-carded, and a player from each side was sent off during stoppage time. Raja will be among three Moroccan representatives in the draw with Hassania Agadir and 2018 quarter-finalists Renaissance Berkane securing places Saturday. Record three-time Confederation Cup winners CS Sfaxien of Tunisia coasted to a 3-0 home victory over Vipers SC of Uganda in Sfax after a goalless first leg. Alaa Marzouki and Firas Chaouat netted in the opening half and Angolan Manucho, once on the books of Manchester United, completed the scoring during stoppage time. Etoile Sahel, twice winners of the second-tier African club competition and the other Tunisian challengers, received a bye into the group phase. Zambia will also have two representatives with Nkana FC drawing 0-0 away to San Pedro of the Ivory Coast to join Zesco United, who qualified Saturday. San Pedro did their chances of overcoming a 3-0 first-leg deficit no favours when they missed a 35th-minute penalty in Abidjan. Kampala Capital City Authority of Uganda came much closer to wiping out a 3-0 first-leg loss by defeating AS Otoho Oyo of Congo Brazzaville 2-0 on a rain-soaked Kampala pitch. Qualifiers Asante Kotoko of Ghana and Enugu Rangers of Nigeria scored predictable home victories, but the margins were closer than expected. Kotoko brought a 3-2 lead over Coton Sport back from Cameroon and were leading 2-0 in Kumasi thanks to goals from Amos Frimpong and Maxwell Baakoh. But Coton had the final say with Oumarou Sali scoring on 86 minutes to limit the famed Ghanaian outfit to a 2-1 second-leg win. Enugu, also first-leg winners on the road, fell behind at home to Bantu FC of Lesotho before goals from Ajani Ibrahim and Godwin Aguda secured a second 2-1 win over the minnows.